Chain Station CD Release Party in Effingham. Join us at Tuscan Hills Winery at the Stellar Cellar. Chain Station is a 4-piece, high-energy, get ‘em out on the dance floor string band from Denver, Colorado. Their music is well-steeped in Americana roots, with vocal harmonies that are high, lonesome, and tight. Their picking ranges from lightning-fast to mountain mellow. They are a bluegrass band that would satisfy a picky old-timer and delight fans of newgrass, a delicate balance indeed. 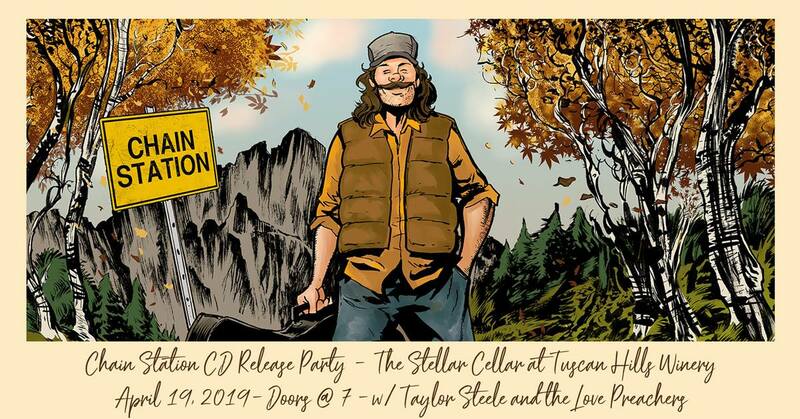 Poss Music Works welcomes Chain Station back to Effingham at Tuscan Hills Winery in the Stellar Cellar with Taylor Steele & The Love Preachers opening up the night!